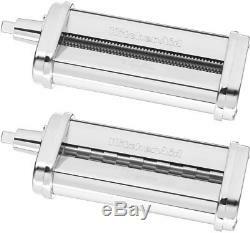 KitchenAid Capellini and Lasagnette Cutter Attachments for KitchenAid Stand Mixer. Make fresh pasta at home tonight with this Pasta Cutter Set from KitchenAid designed for use with your KitchenAid stand mixer's power hub. This set includes a lasagnette cutter for thick fettuccine or egg noodles and the capellini cutter for spaghetti and angel hair pastas. Cappellini cutter and a lasagnette cutter compatible with any KitchenAid stand mixer. Attachments connect to the Power Hub on your stand mixer and uses the motor's power for operation. Lasagnette cutter creates thick fettuccine or egg noodles. Capellini cutter creates spaghetti and angel hair pastas. Easy to use and easy to clean. All-metal housing ensures lifelong operation. California residents see Prop 65 WARNINGS. : 8.9 Product Height in. : 1.9 Product Width in. : 3.4 Appliance Type: Part/Accessory Brand Compatibility: KitchenAid Stand Mixer Compatible Appliance Type: Mixer Hardware Included: No Part Type: Other Returnable: 60-Day Style: Modern. 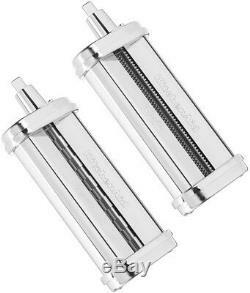 The item "KitchenAid Capellini Lasagnette Cutter Attachments Stand Mixer Pasta Roller New" is in sale since Monday, January 7, 2019. This item is in the category "Home & Garden\Kitchen, Dining & Bar\Small Kitchen Appliances\Countertop Mixers". The seller is "onlinehomeimprovementdeals" and is located in Phoenix, Arizona. This item can be shipped to United States, Canada, United Kingdom, Denmark, Romania, Slovakia, Bulgaria, Czech republic, Finland, Hungary, Latvia, Lithuania, Malta, Estonia, Australia, Greece, Portugal, Cyprus, Slovenia, Japan, China, Sweden, South Korea, Indonesia, Taiwan, South africa, Thailand, Belgium, France, Hong Kong, Ireland, Netherlands, Poland, Spain, Italy, Germany, Austria, Bahamas, Israel, Mexico, New Zealand, Philippines, Singapore, Switzerland, Norway, Saudi arabia, Ukraine, United arab emirates, Qatar, Kuwait, Bahrain, Croatia, Malaysia, Brazil, Chile, Colombia, Costa rica, Dominican republic, Panama, Trinidad and tobago, Guatemala, El salvador, Honduras, Jamaica, Antigua and barbuda, Aruba, Belize, Dominica, Grenada, Saint kitts and nevis, Saint lucia, Barbados, Bermuda, Brunei darussalam, Bolivia, Ecuador, Egypt, Guadeloupe, Iceland, Jordan, Cambodia, Cayman islands, Sri lanka, Luxembourg, Maldives, Nicaragua, Oman, Peru, Pakistan, Paraguay, Viet nam, Uruguay.